Gensco Laboratories announced the launch of ColciGel (colchicinum 4X) indicated for the treatment and prophylaxis of acute gout flares in adults, the first prescription transdermal gel approved for this condition. 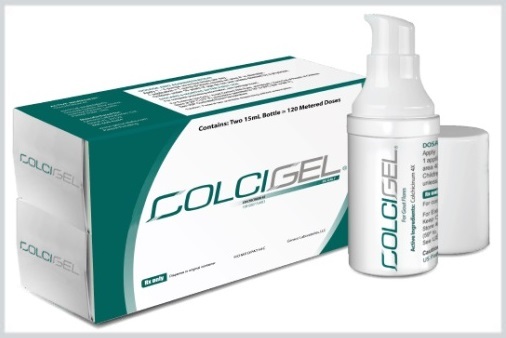 ColciGel is a transdermal gel that contains colchicinum, an alkaloid anti-inflammatory. ColciGel has shown to penetrate the dermal layer at the local site of application. With limited systemic absorption, there is less potential for drug accumulation. Study results report a reduction in pain associated with gout flares within a few hours or application. It utilizes Metered Dose Technology (MDose) that dispenses the exact amount of medication (0.25mL) per pump. ColciGel is supplied as a carton containing two 15mL bottles. It is available by prescription through specialty pharmacies. For more information call (855) 743-6726 or visit ColciGel.com.